The 24th Amendment is about the barring of Poll taxes. Summary: The 24th Amendment was ratified in 1964, during the administration of Lyndon Johnson, making it illegal to make anyone pay a tax to have the right to vote. When was the 24th Amendment passed? Amendment XXIV was passed by Congress on August 27, 1962 and ratified January 23, 1964. 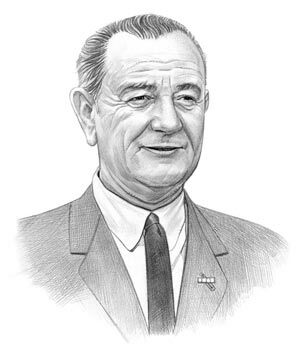 Lyndon Johnson was the 36th President of the United States whose presidency spanned from November 22, 1963 to January 20, 1969. One of the key events during his presidency was the ratification of the 24th Amendment to the Constitution. The cause or reason for this addition to the Constitution was to address the deficiencies of the 15th Amendment by which many Southern states implemented a system of Poll taxes and Literacy tests to prevent poor blacks from voting. Poll taxes were passed by many Southern states as a means of restricting eligible black voters. Poor blacks were not able to pay the Poll tax and therefore could not vote. Literacy tests were also introduced as part of the registration process for voters. People who had not been educated was certain to fail the Literacy test and therefore not be able to vote. Poll taxes were abolished in this change to the Constitution. The Voting Rights Act of 1965 barred the use of literacy tests in all states. Meaning: Congress has the power to make laws to enforce this amendment. The above information provides the text, definition and summary of the amendment. The following Lyndon Johnson video will give you additional important facts and dates about both the personal life and political life of the 36th President of the United States whose presidency spanned from November 22, 1963 to January 20, 1969.